For over eight decades, SOM has been a leading voice in emphasizing structural poetics, or the integration of architectural and engineering efforts into built form. This mashup of rationalism and elegance was on full display at the 2017 Chicago Architecture Biennale, where they collaborated with Mana Contemporary to deliver a pop-up exhibition titled "SOM: Engineering x [Art + Architecture]," that ran from September 2017 through early January 2018 at the Ace Hotel. Among sketches, study models, and impressive structural mockup systems sat a lineup of more than 30 structural models at 1:500 scale, arranged by height. 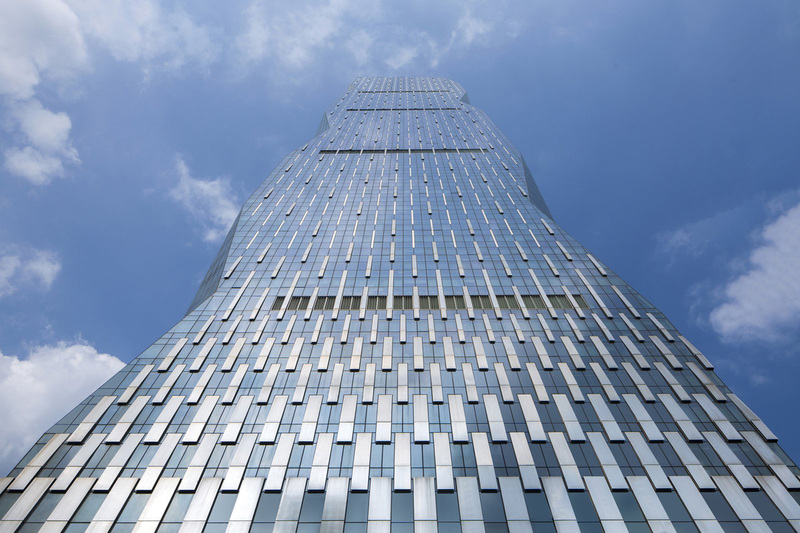 Hangzhou Wangchao Center has seamlessly grown out of this impressive survey of work—a design that exists as proof-of-concept to SOM’s design approach. 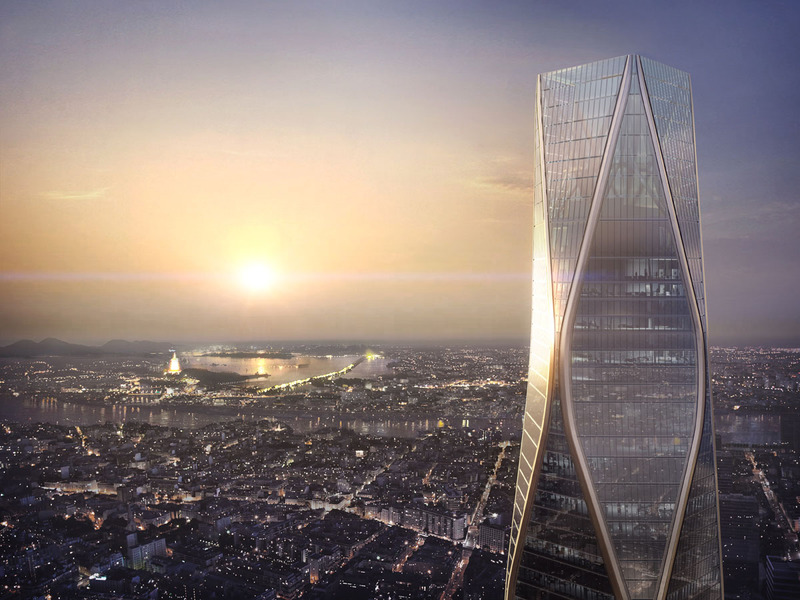 Along with a robustly reinforced concrete core, the 54-story mixed use tower is defined by eight “mega-columns,” as defined by SOM, which weave back and forth as they track upwards. Secondary perimeter columns establish uniform bay spacing to the interior, connected diagonally to the primary corner columns with a Vierendeel transfer truss. Beyond creating an expressive formal shape, the structural configuration offers performance benefits such as wind load reduction and flexible column-free interior floor plates. 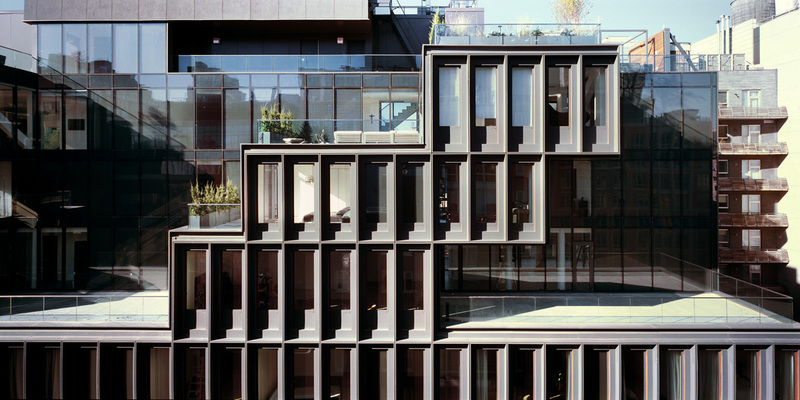 The resulting unitized facade was carefully designed into a rationalized stepped surface to allow for flat planar glazing units. 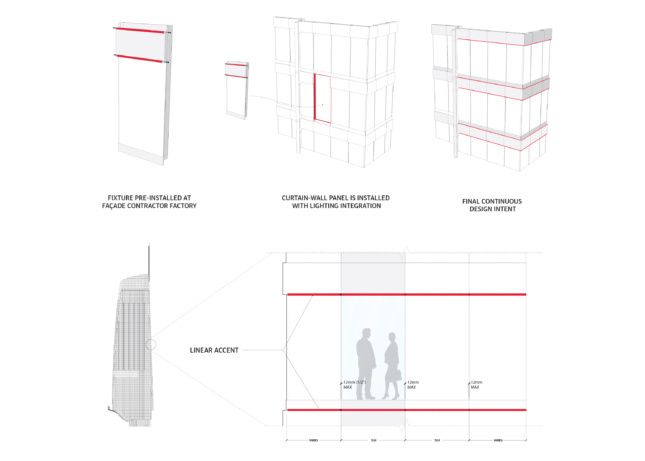 The canted curtain wall, which follows the tapered massing of the tower, is organized into floor-to ceiling units which slip past the finished floor level to create a sense of continuity from the interior. A recessed shadow box and horizontal fin assembly further articulates a reveal gap between floor plates. 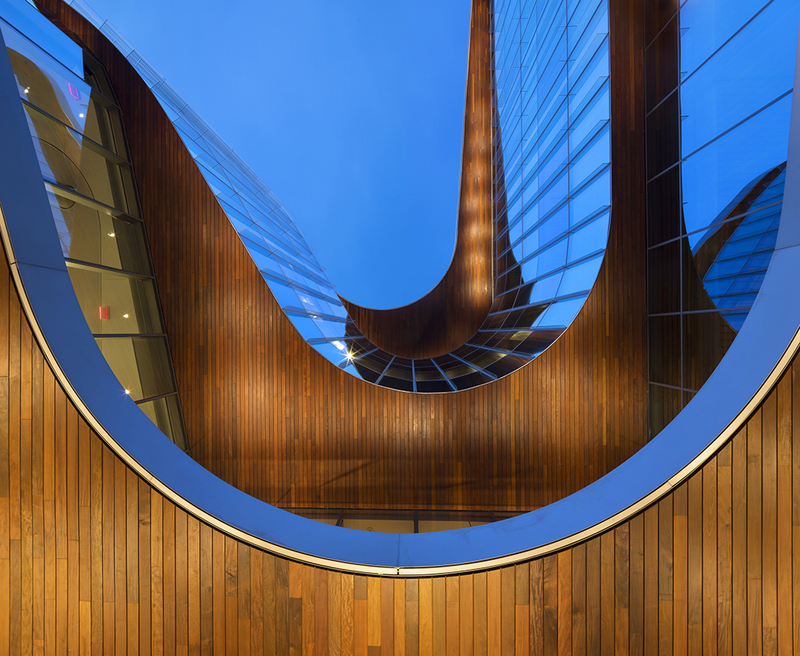 This carefully developed building envelope detail offers a discrete path for the building to accommodate natural ventilation. The ground floor building enclosure was engineered to accommodate 36-foot-tall glazing panels around the perimeter of the tower, dissolving the boundary between the surrounding cityscape, and highlighting a massive stone-clad core that blooms outward into the space of the lobby. The tower is currently under construction, with piles for the foundation system being driven into the ground. The project will be complete by 2021 just ahead of Hangzhou’s hosting of the 2022 Asian Games, a multi-sport event held every four years. The tower formally breaks from a 1974 ordinance requiring towers to have flat roofs for helicopter rescue in the event of fire. A tapered form was permitted due to advances in fire safety and building technology, such as a reinforced concrete central core that exceeds the city’s current fire code. The facade features a fully integrated, centrally controlled experiential LED lighting developed by StandardVision. The linear fixtures were custom made per floor, and installed throughout each of the tower's 73 floors. One centrally controlled system ties the entire system together. 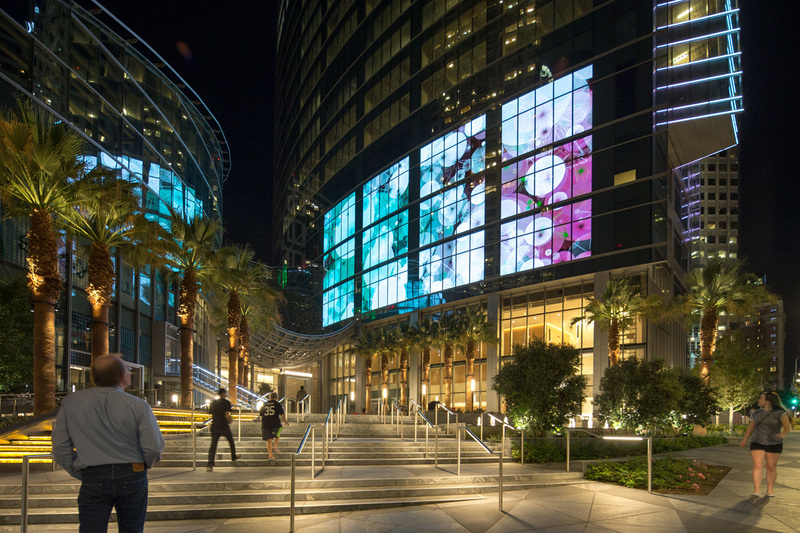 This allows possibility for the facade for incorporate full motion video, artwork, accent lighting, and brand signage as desired. All linear accent lighting was integrated into the glazing panels, and the fixtures were pre-installed in the facade contractor’s shop prior to site delivery. This unitized approach minimized staging time on-site and allowed for a smooth installation workflow. Joshua Van Blankenship, vice president of media platforms for StandardVision, said this was one of the biggest challenges of the project. Another technical challenge was to ensure lighting occurred seamlessly despite traveling over expansion joints in the facade and encountering over 200 parametrically controlled panel widths. 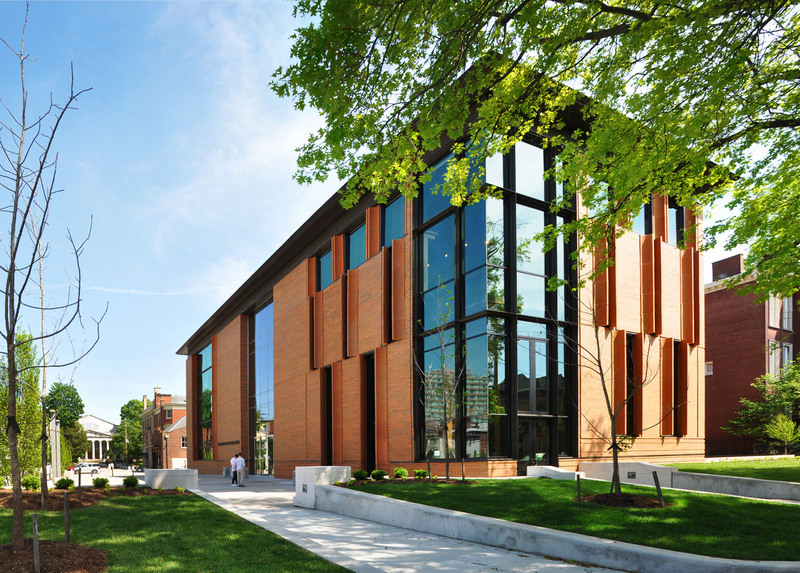 “Resolving these two factors with Benson [the facade contractor] allowed us to save tens of thousands of man-hours in exterior installation, and focus our budget on providing the technology solution the architect wanted without a single SV change order,” he said. Penetrations through the building envelope were reduced to a singular point per floor level. A small kick plate access hatch offers accessibility from the interior. This utility space houses LED drivers for the fixtures and wiring for the system. The detailing and design coordination of this moment in the facade went through rigorous proof of concept water-testing to ensure performance. Van Blankenship credits a close design-build relationship between documentation and fabrication teams at Benson and StandardVision for the success of the integrated lighting system. “Our designers in L.A. were regularly working these shifted-hours to have time to overlap with Benson's Singapore team, and by the end of the process, we were incredibly efficient in defining how our respective scopes were going to relate.” he said. “Throughout this entire process AC Martin, Turner and Rosendin (the electrical contractors) were great partners in helping to make this hybrid system work.” Wilshire Grand’s lighting system highlights a robust curtainwall system that was optimized for California’s seismic loads and solar gain. 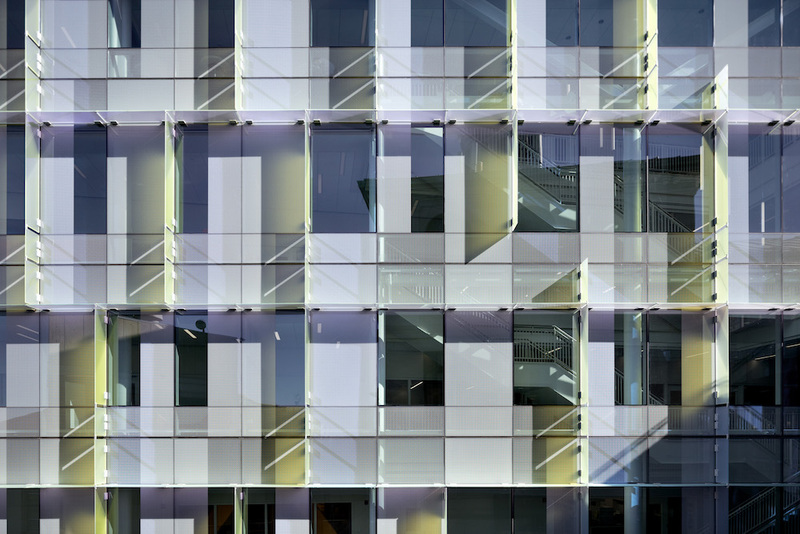 Thornton Tomasetti developed a parametric facade panelization model that consolidated and synchronized information in required for architectural documentation and specialty construction. Concurrently, Glumac developed energy models and shading studies throughout the design process to study building envelope performance. The models take into account shade from DTLA’s surrounding context cast onto the tower, proposing a series of varied fin depths along the south facade. 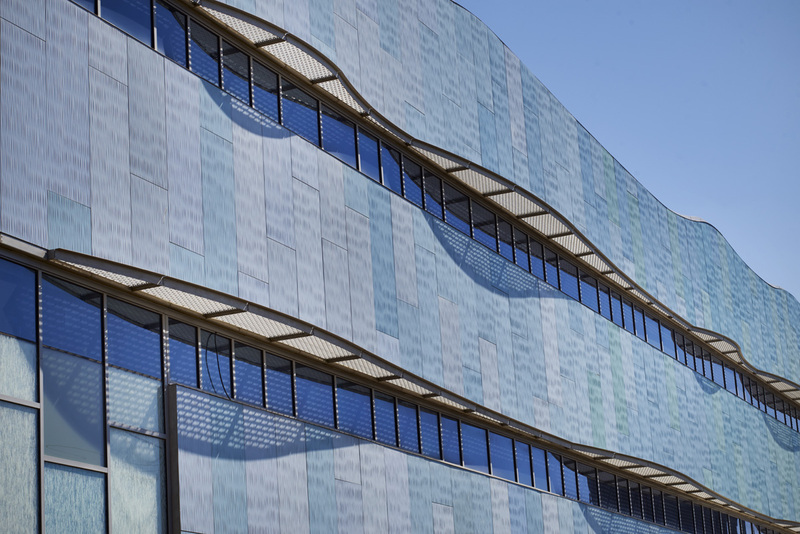 This level of study saved curtain wall material while maximizing the shading potential of the building envelope. California’s Title 24 energy code limits glazing to 40 percent window-to-wall ratio (WWR), but with these advanced parametric modeling and analysis tools, the design teams were able to demonstrate a larger WWR of 50 percent could still outperform California code baseline through careful specification of glazing material, insulation values, and shading schemes. Six years after the University of Washington opened its 90,000-square-foot Molecular Engineering and Sciences Building (MolES), a new addition, the Nano Engineering and Sciences Building (NanoES), has nearly doubled the size of the complex located at the center of the University of Washington (UW) Seattle-based campus. The Seattle offices of Zimmer Gunsul Frasca Architects LLP (ZGF) programmed and designed the two-phased MolES and NanoES buildings, which together provide 160,000 square feet of research space in the field of interdisciplinary molecular engineering considered critical for ensuring future economic, environmental and medical health worldwide. NanoES features unique fabrication and characterization equipment to measure and manipulate molecules at the nanoscale. This second phase relies on custom-engineered products from Wausau Window and Wall Systems to achieve more stringent building and energy codes than were initially in place for phase one. An intensive three-day series of design charrettes brought together the owner, architects, general construction company, curtain wall manufacturer, and glass installer at the onset of the project. Based on the charrettes' targeted value, design goals, code requirements and LEED Silver criteria, Wausau's four-sided structurally glazed (4-SSG) unitized curtainwall system was selected for the project. "The 4-SSG unitized curtainwall was glazed and sealed in Wausau’s factory-controlled conditions. This achieved the targeted designed performance and industry-leading, 10-year warranty required for the project and for the UW campus facility plan," explained Brad Glauser, Wausau’s Northwest Territory manager. "The units were built one lite wide by one floor tall, with interlocking vertical mullions that aligned with the adjacent rain screen’s stone façade, thus creating a true continuous thermal envelope." One benefit of ZGF's integrated design approach was improved communication, which led to a reduction of Addenda, Requests For Information and Architect’s Supplemental Instructions submitted during the pre-construction and construction process. The resulting assembly of the unitized system was installed and enclosed within five weeks. Some of the curtainwall units on NanoES were up to 16 feet tall. To carefully install each unit, lift equipment hoisted each unit onto embeds at face-of-slab, where they were anchored with J-Clips. 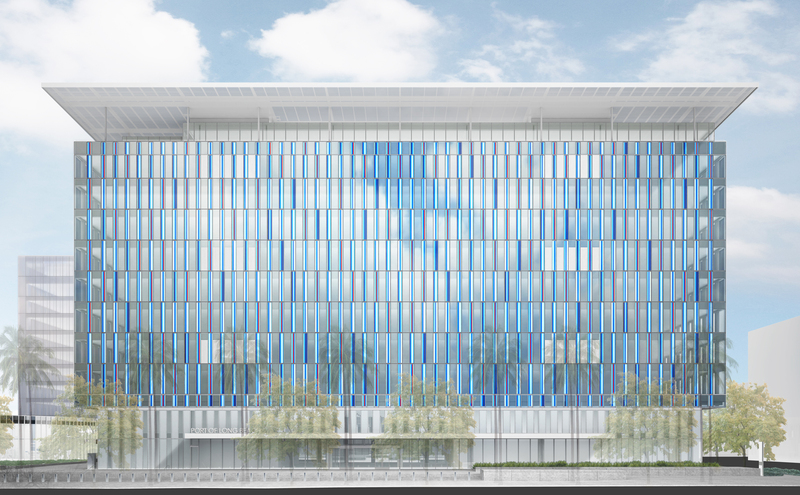 In total, more than 22,000 square feet of curtainwall were installed on the project. Integrated within the curtainwall are zero sightline project-out awning windows with both manual and motorized operators. In certain areas, windows are programmed to automatically open at night to provide natural ventilation and lessen energy load demands on the HVAC system. 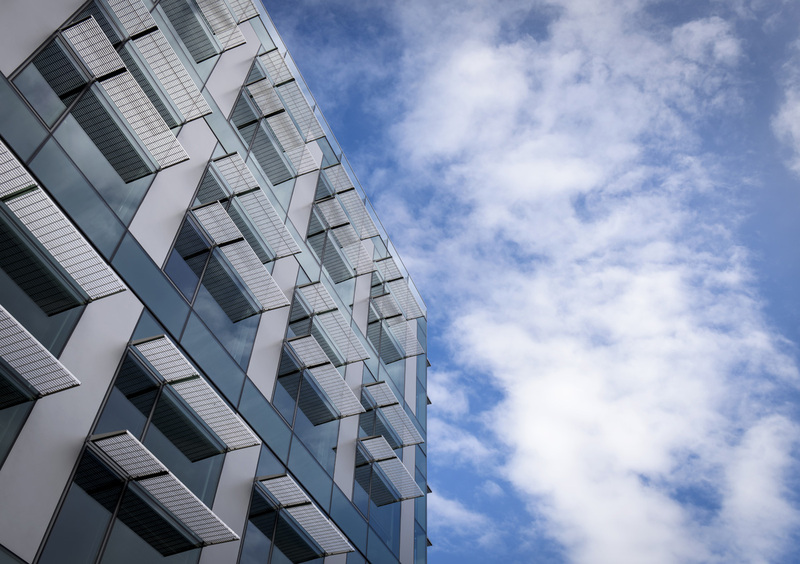 Complementing the high-performance curtainwall and window systems, custom, 6-inch-deep aluminum fins at vertical members and 24-inch-deep exterior sun shades were integrated into the building envelope. ZGF designed customized shadow boxes, similar to those on MolES, to add visual depth to the assembly. These elements are all protected with a two-coat "Silver Shadow" mica coating that matches the neighboring MoIES building. Linetec manufactures the resin-based liquid paint through a process that captures the materials volatile organic compounds (VOC) content using a 100 percent air capture system and safely destroys the VOCs with a regenerative thermal oxidizer. Linetec then reuses its heat energy byproduct to improve process energy efficiency. This process of reuse is completed before the material exits the paint line. 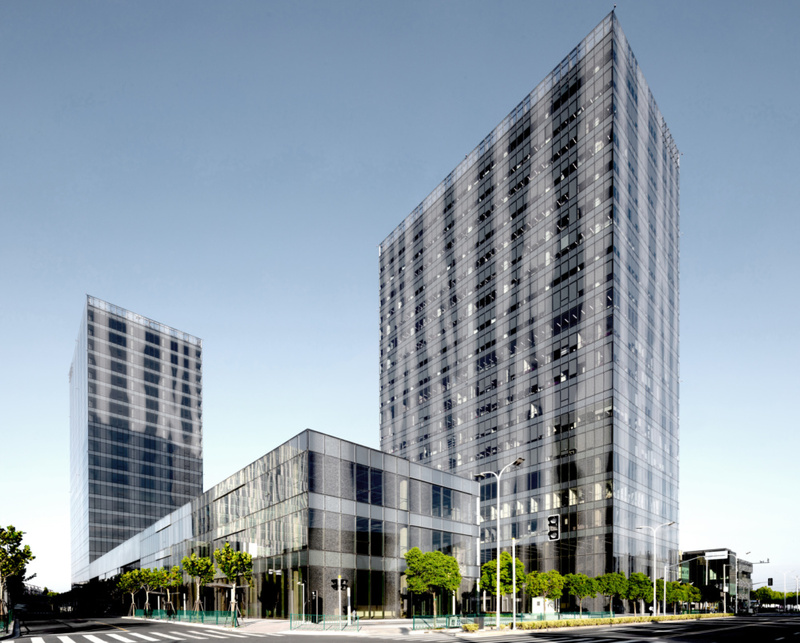 "The combination of durably finished, 4-SSG unitized curtainwall and high-performance glass achieved UW's requirements," summarizes Glauser. 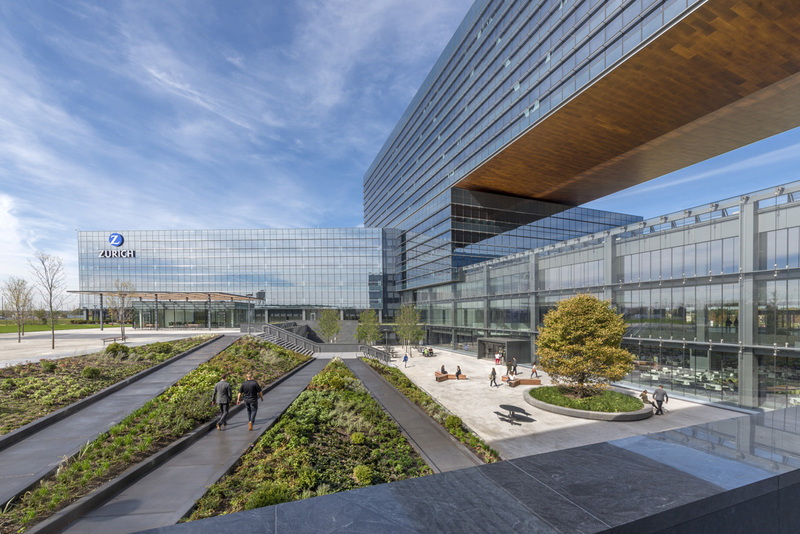 "We exceeded the national forerunning Seattle Energy Codes, as well as UW's energy-efficiency goals with low solar heat gain coefficient, low U-Factor and high condensation resistance. At the same time, high visible light transmittance was maintained, providing occupants with access to daylight, a transparent connection to views and interior comfort. We stayed ahead of schedule and within budget. In my book, this definitely is a success story." Elaborating on this success in the Daily Journal of Commerce, ZGF's associate partner Nicole Cooper, AIA, concluded, "The strong partnership between UW and the design team, as well as a commitment to sustainability, brings the Molecular Engineering and Sciences Building and the Nano Engineering and Sciences Building together to create one high-performance building that fosters a collaborative research environment for years to come."